Check these out! Whether displaying your Scottish pride in these tartans or just love plaids, your pet will enjoy showing these off. 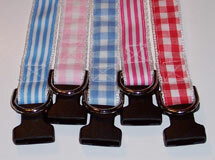 Gingham checks will bring out the best in your pet. Lots of dots and yikes stripes are included in this category. These are finished with quality nickel plated hardware and are available in various sizes.